There were a few twists and surprises in the first playoff round. In the Eastern Conference, the Baie-Comeau Drakkar were eliminated by the Moncton Wildcats although they were deemed to be the favourite by most accounts. 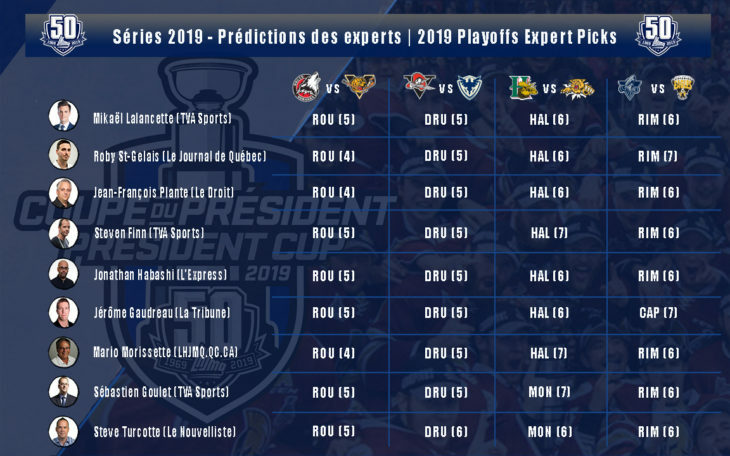 Seeded first in the conference following the regular season, the Halifax Mooseheads had to muster up everything they had over seven games to find a way to get by the Québec Remparts. 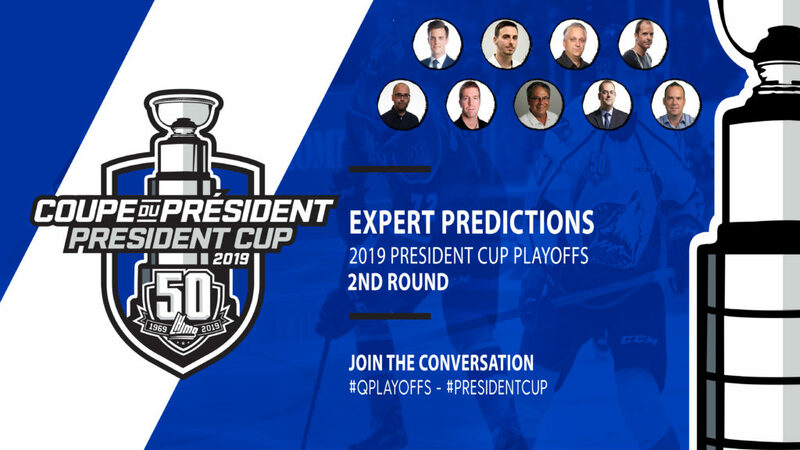 In the Western Conference, the Shawinigan Cataractes served as a reminder to the Rouyn-Noranda Huskies that talent and big names are not always enough to win. And then, the matchup between the Victoriaville Tigres and the Val-d’Or Foreurs extended all the way into overtime at the end of the seventh game. And the Tigres came out on top! Francis Leclerc is greatly to blame for sending his former team off to an early vacation. Thanks to a save percentage of .932, the veteran goaltender stifled one of the most productive offensive units in the QMJHL. In addition, the Wildcats had to soldier on without the services “on two feet” of their spark plug, Jakob Pelletier. Moncton’s penalty kill maintained a 90 % success rate and that unit will again play a key role against Halifax. The team that will play host to the next Memorial Cup had quite a scare against the Red Devils. Some of their big guns stayed silent against Quebec City and coach Éric Veilleux must be hoping that his players will wake up against the Wildcats, who were dominated all season long by their Nova Scotian rivals. The Oceanic took care of business in seven games against the Chicoutimi Sagueneens and, at this time of the year, having one week off is a good thing. Alexis Lafreniere has all the tools to be a game changer and he was well supported by his veteran teammates over this first round. Goaltender Colten Ellis was able to stay cool during what amounted to about five periods of overtime. Even if the Nova Scotian squad won both its matchups against Rimouski this season, it must be noted that the two games were played over a period of five days in October. The Screaming Eagles had to go through a seven-game battle against the Charlottetown Islanders and they will again need that their goal scorers Mitchell Balmas and Egor Sokolov be on top of their game to come up with wins and take advantage of the 2-3-2 format for this playoff series. The Rouyn-Noranda Huskies suffered first-degree burns against the Shawinigan Cataractes and you can bet coach Mario Pouliot won’t need to say much to remind his players that they best avoid playing with matches facing the Tigres. Although they are part of the same conference, the Huskies and the Tigres haven’t faced each other since December 15. Since then, the Abitibi-based team, which beat its Victoriaville rivals four times, has added a few quality players to their roster. The Tigres chose to do the opposite. Louis Robitaille’s players, who had to go through a long, drawn-out battle against the Val-d’Or Foreurs, won’t be returning twice to Rouyn-Noranda in this series. One thing you can predict for sure: goaltender Tristan Cote-Cazenave will be seeing a lot of rubber over the next week. Some people like to repeat over and over that the playoffs are a brand new season. You can bet that the Sherbrooke Phoenix organization gives credence to this belief. Over the regular season, Drummondville won all six games against the Eastern Townships squad, with an overwhelming edge in goals scored (33-9). In the first round against the Blainville-Boisbriand Armada, the Voltigeurs let one game get away from them although they dominated their rivals 49-20 in shots on goal. Led by Maxime Comtois and Joseph Veleno, the Drummondville offence is terrifying. The defence, even when backup goaltender Anthony Morrone takes over for OIivier Rodrigue, is airtight. On the Phoenix side, although he is only 17, Samuel Poulin is a key part of the offence. He will need support from his teammates to be able to guide his team to one or two wins in this series.